We’d love your help. 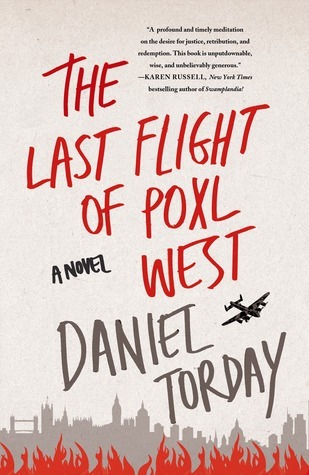 Let us know what’s wrong with this preview of The Last Flight of Poxl West by Daniel Torday. A stunning novel from award-winning author Daniel Torday, in which a young man recounts his idolization of his Uncle Poxl, a Jewish, former-RAF pilot, exploring memory, fame and story-telling. All his life, Elijah Goldstein has idolized his charismatic Uncle Poxl. Intensely magnetic, cultured and brilliant, Poxl takes Elijah under his wing, introducing him to opera and art A stunning novel from award-winning author Daniel Torday, in which a young man recounts his idolization of his Uncle Poxl, a Jewish, former-RAF pilot, exploring memory, fame and story-telling. All his life, Elijah Goldstein has idolized his charismatic Uncle Poxl. Intensely magnetic, cultured and brilliant, Poxl takes Elijah under his wing, introducing him to opera and art and literature. But when Poxl publishes a memoir of how he was forced to leave his home north of Prague at the start of WWII and then avenged the deaths of his parents by flying RAF bombers over Germany during the war, killing thousands of German citizens, Elijah watches as the carefully constructed world his uncle has created begins to unravel. As Elijah discovers the darker truth of Poxl’s past, he comes to understand that the fearless war hero he always revered is in fact a broken and devastated man who suffered unimaginable losses from which he has never recovered. To ask other readers questions about The Last Flight of Poxl West, please sign up. A Jewish teenager, Elijah, reveres the older man who is his Uncle Poxl. This man has time for him, takes him to museums, discusses art and literature with him and tells him stories of his life during the war. This is the bare bones of the story but this is a story within a story and telling more would ruin this book for future readers. There is something so tender in the way this is written, the characters so likable. The art of storytelling, the interpretation of memory, experiences and regrets, A Jewish teenager, Elijah, reveres the older man who is his Uncle Poxl. This man has time for him, takes him to museums, discusses art and literature with him and tells him stories of his life during the war. This is the bare bones of the story but this is a story within a story and telling more would ruin this book for future readers. There is something so tender in the way this is written, the characters so likable. The art of storytelling, the interpretation of memory, experiences and regrets, the importance of relationships and the detriment of fame, are what I kept thinking about after finishing this book. It is difficult for me to explain why I liked this book as much as I did. It is a quiet book, a book full of regret and some deceit and yet it made me realize how fragile relationships are, how we need to take better care of and appreciate them. Poxl's war experiences are his own, but memories and relationships are universal, this book made me think and that is a good thing and enough of a thing for one book to do. Good and poignant read. The Last Flight of Poxl West is an excellent novel, exploring the ways in which history can easily be romanticized, even if there's an underlying darker truth beneath it. It's great WWII fiction but more than that, it's the story of love and how it can become misdirected. I had the joy of reading this pre-publication and trust me, this is a book you want to read. More in a bit as I sort through what is and what isn't a spoiler, but for now just Hooray!! Os pongo en situación: este libro es una novela que intercala dos historias. La primera, en una época un poco más moderna, nos cuenta la historia de Eli y la admiración que siente por su tío Poxl West, que recientemente ha publicado un libro superventas sobre su experiencia como piloto de la RAF durante la Segunda Guerra Mundial. Y como ya os imaginaréis, la otra línea argumental es el susodicho libro. Casi al principio, poco después de la publicación del libro del tío Poxl, un estudiante univers Os pongo en situación: este libro es una novela que intercala dos historias. La primera, en una época un poco más moderna, nos cuenta la historia de Eli y la admiración que siente por su tío Poxl West, que recientemente ha publicado un libro superventas sobre su experiencia como piloto de la RAF durante la Segunda Guerra Mundial. Y como ya os imaginaréis, la otra línea argumental es el susodicho libro. Casi al principio, poco después de la publicación del libro del tío Poxl, un estudiante universitario pregunta durante una de las presentaciones algo parecido a "¿De verdad era necesaria otra novela así?" Y aquí tenéis mi respuesta: no. Mira que yo he leído pocas novelas históricas, pero esta es sumamente parecida a todas ellas. La historia trágica de un checo que quería matar nazis, que tiene unos cuantos amoríos de los que tiene que separarse por culpa de la guerra y por los que se atormenta cada cinco líneas. HOW ORIGINAL. Se me ha hecho un libro insoportable, como ya os podéis imaginar. Me ha aburrido hasta la médula, me ha parecido repetitivo y cansino, y he estado tentado de dejarlo unas mil millones de veces. El sentimentalismo no resultaba realista y quizás demasiado forzado en algunas situaciones. No sé, a lo mejor es que este libro no es para mí. Lo único que me ha gustado un poquito más ha sido el final, pero para nada salvaba el resto del libro. Joan Jett once sang that “Everybody needs a hero,” which is certainly the truth for fifteen-year-old Eli Goldstein, who is searching for a touchstone to transcend his Jewish consciousness, in 1980s Boston. His hippie-ish rabbi in Hebrew school has tried to turn him on to the kabbalah, but Eli worships his surrogate Uncle Poxl, a flamboyant and charismatic scholar, and a bomber pilot in WW II. During museum, opera, and symphony outings, Poxl taught Eli to appreciate the finer nuances of art; over Joan Jett once sang that “Everybody needs a hero,” which is certainly the truth for fifteen-year-old Eli Goldstein, who is searching for a touchstone to transcend his Jewish consciousness, in 1980s Boston. His hippie-ish rabbi in Hebrew school has tried to turn him on to the kabbalah, but Eli worships his surrogate Uncle Poxl, a flamboyant and charismatic scholar, and a bomber pilot in WW II. During museum, opera, and symphony outings, Poxl taught Eli to appreciate the finer nuances of art; over sundaes at Cabot’s, Eli became the “constant listener” of Poxl’s manuscript pages of his (as yet) unpublished memoir, Skylock, about his time with the British RAF. Uncle Poxl became Eli’s mentor and first demonstrable Jewish hero. However, Poxl’s story as Jewish witness to the War is also a confession of betrayal to the women he loved the most, including his mother, who he left behind in Eastern Europe during the Anschluss. Knowing his mother was sent to a concentration camp “was like imagining every star in the sky blotted out by some small boy with a pin whose touch extinguishes each light.” His bombing missions over Germany, we read, “had wrested fate from the inevitable bearing down of history.” Hence, Poxl’s revenge on the Nazis. Poxl West, aka Leopold Weisberg, is a Czechoslovakian émigré who became a bomber pilot for the British RAF during WW II, leaving more than one lover behind in his wake. Once his memoir was published, he became an overnight literary sensation, but he also cut a dashing Errol Flynn-ish figure as a bomber pilot over Nazi Germany and lover of tragic women. The memoir is included in full, told in alternating sections with Eli’s story. Eli is now an adult, looking back on his adolescent years, and trying to come to terms with his own perceptions of memory, history, and betrayal. Poxl never sent the signed copies of his memoir to Eli as promised, which was just the first in a series of disappointments. I have only a few complaints, which register as minor against the scope of the novel’s merit. The memoir itself, outside of the second narrative, doesn’t strike me as a book that would become an overnight sensation in the 1980s. It may be a moving addition to the many Holocaust memoirs that have preceded it, but it doesn’t exactly break new ground, at least not proportional to its colossal success. Also, Skylock was considered too sexually graphic, which puzzled me. It was actually rather tame for the 1980s. And, Torday gets a little heavy-handed with clichés at times, but it is eclipsed by the bounty of painterly and poetic images. I was excited to read this novel. The story of a Jewish WWII RAF pilot who goes on to publish his memoirs more than forty years after the war, sounded interesting. Poxl West, born Leopold Weisberg, tells a story within a story, as we read his memoir as well as his nephew's narrative set in 1986 as Poxl's book is published. I was eager to be taken back in time and learn about Poxl's experiences during the war but half way through I realized the past didn't come alive for me, I wasn't engaged by th I was excited to read this novel. The story of a Jewish WWII RAF pilot who goes on to publish his memoirs more than forty years after the war, sounded interesting. Poxl West, born Leopold Weisberg, tells a story within a story, as we read his memoir as well as his nephew's narrative set in 1986 as Poxl's book is published. This was fine, but a little underwhelming. Maybe just because I figured out where it was going about a third of the way through? I dunno. A longer review to come. The Last Flight of Poxl West alternates between two related stories - a World War II “memoir” and a story about a relationship between young Elijah Goldstein and his uncle Poxl. This structure breaks up the story nicely and provides needed perspective to the memoir sections, which make up most of the novel. In summary, The Last Flight of Poxl West is a good story and extremely well-written, with characters that experience deep emotions and complex moral issues. Eli, a Jewish teenager in Boston, w The Last Flight of Poxl West alternates between two related stories - a World War II “memoir” and a story about a relationship between young Elijah Goldstein and his uncle Poxl. This structure breaks up the story nicely and provides needed perspective to the memoir sections, which make up most of the novel. In summary, The Last Flight of Poxl West is a good story and extremely well-written, with characters that experience deep emotions and complex moral issues. Eli, a Jewish teenager in Boston, whose grandparents immigrated from Europe, whose parents are modestly successful professionals, loves and idealizes his Uncle Poxl, who is “a writer and an artist and a war hero”. The extent of Eli’s hero worship is shown when Poxl reads from his memoir: “And when he finally gave us what we wanted - and that audience wanted so much from Poxl West, the first Jew so many of us had heard of who had not only survived the Nazi threat but had combated it, literally - and narrated what happened the night he crawled into the cockpit of a Lancaster bonber, when he piloted a plane so that his bomb aimer could drop blockbuster bombs that created a firestorm that destroyed almost every building in Hamburg, it was as if every villain in God’s unholy world had been burned in the caldron of fire my uncle Poxl had lit.” That’s a lot to live up to, and Eli’s first person narrative is about his projections and disappointments, as well as the importance of stories. Eli is a likeable and believable character. This debut novel by David Torday employs a story-within-a-story plot device to dramatic effect. Beginning with the narration of Elijah Goldstein, a fifteen-year-old student, it recounts his relationship with his uncle Leopold Weisberg, known as Poxl West. Poxl introduces him to cultural life around Boston --opera, symphony, literature and art. As Elijah learns more about Poxl’s early life and exploits during World War II, his feelings progress from love and admiration to hero worship. He also de This debut novel by David Torday employs a story-within-a-story plot device to dramatic effect. Beginning with the narration of Elijah Goldstein, a fifteen-year-old student, it recounts his relationship with his uncle Leopold Weisberg, known as Poxl West. Poxl introduces him to cultural life around Boston --opera, symphony, literature and art. As Elijah learns more about Poxl’s early life and exploits during World War II, his feelings progress from love and admiration to hero worship. He also develops a more mature understanding of the Jewish experience as Poxl tries out his war story during their cultural encounters. To place a hold, click here The Last Flight of Poxl West . If you like this book, you might try The Great Fire by Shirley Hazzard. Lo tiene todo: amor, guerra, venganza, inspiración. El autor escribe de maravilla y utiliza referencias que demuestran su cultura. Son dos tramas que están enlazadas entre sí y se van combinando a lo largo del libro. I only gave it a one star because it doesn't have a no star. This was supposed to be heartwarming? This is nothing heartwarming about it. There are no likable characters, no story line that I could see. Hard not to spoil this book, so if you ask me, I'm just going to respond by asking why you haven't read it already. It's truly senseless not to. But as he delves deeper into Poxl’s history, Eli begins to see that the life of the fearless superman he’s adored has been much darker than he let on, and filled with unimaginable loss from which he may have not recovered. As the truth about Poxl emerges, it forces Eli to face irreconcilable facts about the war he’s romanticized and the vision of the man he's held so dear. The hero of this story, if you will, is Poxl West, Jewish air bomber during WW2. He writes a memoir in his later years, which he dedicates to his young nephew, Eli. With the success of the memoir, Poxl heads out on tour and leaves Eli to come to terms with the incidents that are recounted in the memoir - not things that Eli loved his uncle for. Unfortunately for me, I found the first 100 pages or so to be quite tedious. Once I engaged with the dual narratives, I quite enjoyed it. However, less of the memoir and more of Eli would have been a far different book - and one I would have preferred to read. I just think the memoir was just too much and really dragged the pacing of the story down. I would, however, happily recommend this book as it takes a tired idea (stories of World War 2) and threw a new spin on it and, for that alone, I think this should be at least looked at! this was an interesting and well written book about a close family friend, a Jew from Czechoslavakia writing his memoir of his experience as a pilot with the RAF during WWII. the book alternates between the manuscript of the memoir and the realtionship of the young boy who views Poxl as a surrogate grandfather. The memoir (book within a book) tells a touching story as does the alternating chapters. Still i sometimes found the book dragged and especially in the first third. I would recommend it an this was an interesting and well written book about a close family friend, a Jew from Czechoslavakia writing his memoir of his experience as a pilot with the RAF during WWII. the book alternates between the manuscript of the memoir and the realtionship of the young boy who views Poxl as a surrogate grandfather. This is a book about a book. The narrative of The Last Flight of Poxl West alternates between (1) a young man‘s account of his relationship with a book called Skylock and its author Poxl West, and (2) excerpts of Skylock itself, a tale of Poxl West’s experiences in WW II. I myself preferred the sections of Skylock to the young man’s impressions. Nevertheless, as a whole, the author movingly explores how loss and trauma affects not only the person who experiences it but those close to him or her. I picked up this book because the author worked at my college. I didn’t know what to expect. It was really well written and the story was engaging and moving. There are really two connected stories being told and the resolutions for both of them aren’t satisfying in a very intentional way. They’re not neat and tidy stories but they’re not supposed to be. I would definitely suggest the book. It’s worth a read. Fictional account of a Czeck Jew who was sent initially to the Netherlands and eventually arrived in London. He puts his experience as a pilot to use as a pilot for his adopted country raining bombs on the Germans who killed his family. According to the book he wrote, telling the story to his adopted nephew over ice cream after visits to the symphony or art gallery, he wanted to revenge himself on the Germans. But that might not be the entire story. Daniel Torday uses a classic story-within-a-story structure to explore the fascinating character of Poxl West and the nephew who hero worships him as a Jewish fighter pilot in The RAF during World War II. How Poxl fled to England as a young Czech refugee just before the war started is fictional but authentically reflective of the real stories of many young people of the time. I really enjoyed reading his story but did think that the "big reveal" was not really much of a surprise. I slogged through this book. The format was unique and I wanted to like it, but I just couldn't get wrapped up in the story or the characters. There were some parts where the action picked up and I became engaged. But then Poxl would wax philosophical and I would need to reread the paragraph several times. Just ok.
A bit disappointing. The twist was predictable. It short, and overall enjoyable as a reading experience, but not as deep as I had hoped. If you're looking for a sort of coming of age story set during WWII, this might be good for you, but don't expect to be wowed.